Ideal for classrooms, this Jemini Polypropylene Stacking Chair conforms to BS EN1729 parts 1 and 2. The chair features a moulded polypropylene shell and an epoxy coated steel frame. The chair is suitable for both internal and external use, and can be stacked up to 20 high. 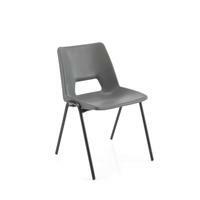 This pack contains 1 charcoal chair with a seat height of 310mm.